LEXINGTON, Ky. — For all but two of the largest six players in the sandwich sector, the recession has not been kind. That’s despite the sector growing 3 percent a year since 2007, according to market researcher Technomic Inc. In short, the biggest guy on the block got bigger. Other than Subway franchised outlets, only Jimmy John’s Gourmet Sandwich Shops saw significant gains, going from a 1.8 percent share of the sector’s sales to 3.7 percent. Yet even Jimmy John’s has seen its high rate of growth in franchise units come down from 28 percent in 2008 to 17 percent in 2011. As it reached 600 units in 2008 and then the 1,000 franchise mark in 2010, it became increasingly harder for Jimmy John’s to grow at the same high rate. Meanwhile, Subway is the 25,000 shop chain that keeps rolling along, growing at a steady 3 to 5 percent in units as if the Great Recession and credit crunch had never occurred. Competitors may be trying to steal a part of Subway’s market share, but it looks like Subway is eating their lunch. From 2007 to 2011, the Subway franchise chain went from 39 percent to a whopping 47 percent of sales in the $24 billion sandwich segment. Arby’s, which is also in Technomic’s list of the top six sandwich chains, dropped from 17 percent to 12.6, according to Technomic figures. 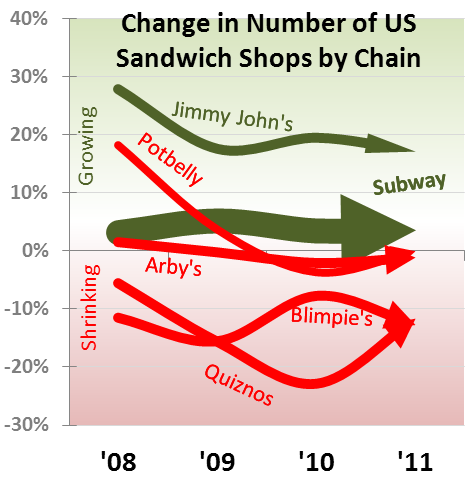 Quiznos fell from 9 percent market share to a dismal 3.8, and Blimpie slid from 1.3 to 0.5. “Subway has hit critical mass,” declares restaurant unit economist John Gordon, president of San Diego-based Pacific Management Consulting Group. Industry watcher Gordon says that Subway has the marketing advantage of being one of the first sub sandwich chains. He thinks the chain has reached the point in its size where it is easier to add to positive brand recognition as the company refines its business model. “Subway has a healthy halo around its public activities. They were able to highlight the customization of the sandwich exactly as the customer wanted it, right before their eyes,” says Gordon. Arguably franchisor Doctor’s Associates Inc. can pin Subway’s success on a secret weapon — it has empowered its franchise owners more than any of its competitors. Early on, Subway trusted local franchise developers to handle franchise sales and development instead of relying on headquarters to take care of it, as many other franchisors did. Restaurant expert Gordon emphasizes that when the Subway chain was small, it pushed franchising authority to local development agents (DAs). These firms resemble a sort of master franchise that sell franchises for an area, receive royalties and support franchise owners through their own field operations managers. “The developer agent model helped considerably because it facilitated the development of large, multiunit franchisees,” says Gordon. Unlike Quiznos, most of Subway’s development agents operate franchises. “Our development agents help build profits through effective marketing and by building restaurants through smart development. They tirelessly work to implement the programs that help our franchisees grow their businesses,” says Doctor’s Associate’s chief development officer Don Fertman. That push of franchising authority back to licensed business owners is counterintuitive for most franchisors. Quiznos, which at one time had 4,500 franchises and now has probably under 2,000, is characterized by small mom & pop owners who own one store. “The growth of Jimmy John’s, Firehouse and Potbelly are driven by the availability of capital, which has recently been problematic,” observes Gordon. “Single-unit operators are hard-pressed to get credit. The risk is perceived to be too high by the lending community.” Gordon quickly adds that a reasonable return on capital also drives franchise sales. “Subway has the least expensive build-out of all these guys,” he states. The franchisor’s delegation to franchisees isn’t just in selling licenses — it is also found in the brand’s national supply chain, franchisee association and, until recently, its national marketing efforts. Subway franchisees have gained control of purchasing, an area that franchisors typically govern. In the beginning Subway founder Fred DeLuca wasn’t particularly enamored with the idea. Obviously the franchisor had concerns about turning national purchasing over to franchise owners. But to his credit he not only allowed the Independent Purchasing Cooperative (IPC) to come into being once the majority of franchisees voted for it, but also assisted with some of the early administrative costs. That cooperative of, by and for franchisees, with its pricing transparency, has effectively kept food prices down. “The purchasing co-op in the group of franchisee-run groups in Subway is probably the most important,” declares Keith Miller, a California Subway franchise owner of three shops. He is the chairman of the Coalition of Franchisee Associations, which represents franchisees of some of the largest brands in America. “It also protects franchisees from high prices caused by vendors who have to give rebates to the franchisor in order to get the order,” says Miller, who was also the chair of the NAASF from 2000 to 2001 in the first year it was created. 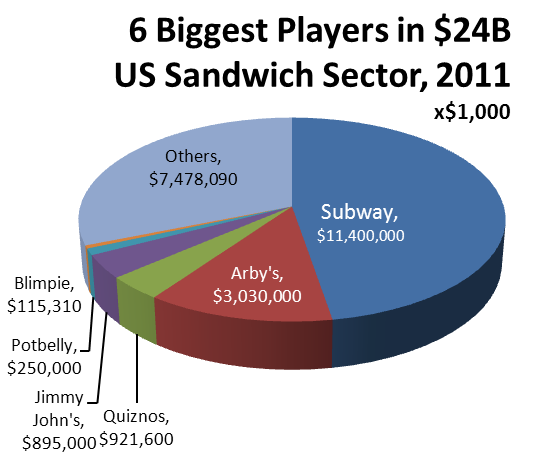 Only two major sandwich brands in the top group have a purchasing cooperative: Subway and Arby’s. Arby’s has an Atlanta-based national purchasing cooperative called ARCOP. It is directed by an elected board of six Arby’s franchisees and one franchisor representative. “We have total transparency with the membership for things like revenues, expenses, sourcing fees and obsolete inventory,” a spokesperson for the cooperative said. The firm’s financials are available to membership. Subway’s franchisees once stood out because they had control of national marketing efforts through the Subway Franchisee Advertising Fund Trust (SFAFT), in contrast to the more traditional approach of the competition, where franchisors ran national advertising and branding. When franchise owners oversaw an ad trust cooperative that marketed Subway foodservices in the 2000s, Miller observes, “We boomed in the early 2000’s, and that had a lot to do with the NAASF recommending and the franchisor allowing the System Advisory Council. It’s always positive when the franchisees are truly integrated into the decision-making process.” That innovative and collaborative franchise model was initiated by Andrew Selden, a Minneapolis-based franchisee attorney, working through the NAASF. Selden is a follower of William Deming’s business model of giving front line players decision-making ability to accomplish total quality transformation in a system. The new System Advisory Council incorporated a broad array of franchisee decision makers — Development Agent advisory council, international purchasing cooperative, ad trust and NAASF delegates — along with franchisor reps. When this group of leaders said do it, it was done. Costs tumbled. Ads grabbed. Operations tightened. “What is amazing is that after these changes in the early 2000s we saw an 18 percent average unit volume growth in stores, yet not a single direct competitor changed a thing for two to three years. That gave Subway owners a big jump. We followed that by rolling out toasters — I think that was in 2004.” Providing toasted subs was a jolt to the competition. As the recession hit, franchisees experimented with, then rolled out a national $5 footlong campaign. Competitor Quiznos followed a traditional corporate management approach of franchisor executives telling store owner-operators what to do. Disconnected from the stores, its top-down management made misstep after misstep. Thousands took it to court for alleged hidden kickbacks that benefited the franchisor, but pumped up store costs for franchisees. Then there was its special million sub giveaway (free subs). That promotion cost Quiznos franchisees roughly $2.25 for a normal $5.29 six-inch sandwich. At the same time Subway franchisees found areas to flatten costs with their $5 footlong. That made them $1.20 per footlong, while increasing sales. In its complex balancing act, the sometimes reluctant and accidental empowerer of franchisees, Doctor’s Associates, fights for more control, like it did over what it considered a key function for a franchisor, deciding on advertising. It won a strategic legal battle against franchisees and took over the ad trust fund in 2010. It now oversees the professionals and the organization that the franchisees once did. Franchisees still retain an advertising advising council that recommends, but doesn’t have the final say. Only one other competitor of the Subway chain has an independent franchisee group. Quiznos has seen the new incarnation of one, a result of the largest franchise settlement to date in quick service restaurants. The new group is struggling. “Communication is key,” declares Tennyson, North American Association of Subway Franchisees chair, about how a collaborative franchise culture is fostered. Having an independent association also helps. Tennyson speaks about how Fred DeLuca, CEO of franchisor Doctor’s Associates Inc., regularly participates in their membership and board meetings and the ease with which the two heads communicate with one another. One result of this collaboration is that the NAASF helped its franchisor redo system standards to better reflect operating realities. “Doctor’s Associates is redoing the field operations manual,” the Association’s chair states. All of those structures have helped in the past, but the future is still unwritten. Market researcher Technomoic reminds us that newcomers are heating up the edges of the market. For one, Firehouse Subs is growing like gangbusters, ending the year at 576 franchise units. Some 50 percent of its locations are owned by multiunit franchisees. Its CEO Don Fox tells Blue MauMau that comparative store sales grew 7.84 percent, while systemwide sales grew 35 percent in 2012 from $285 million in 2011. “We currently have about 110 multiunit franchisees,” says the Firehouse CEO. Darren Tristano, executive vice president of market researcher Technomic, thinks the future for “better sandwich” companies is bright and will likely play out in the continued success of Jimmy John’s and Firehouse Subs. This entry was posted on Thursday, January 17th, 2013 at 8:30 pm and is filed under Economy, Fast Casual, Financial Activity, Food, Foodservice Management, Franchise Activity, Growth, Menu Development/Innovation, Menu Trends, Price, Sandwich. You can follow any responses to this entry through the RSS 2.0 feed. You can leave a response, or trackback from your own site.